You can format the lines on your design by using the variety of sizing, placement, and color options available. Click on the line that you want to change. The lines will then appear with dotted lines. Click on one end of the blue dot to drag, resize and reformat the line. The line will be adjusted and maintain its proportion with clean and clear edges. You can see the proportion by looking on the top left of the screen which shows the width, height, x-axis and y-axis. 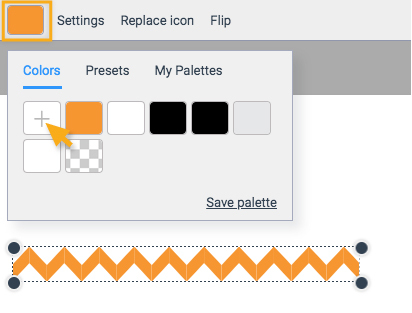 Once you have the line in positioned and sized as you want, click anywhere on the canvas and you are all set. Click on the line that you want to change. The line will then appear with dotted lines. Click on the color box at the top left of your screen in the Property Panel. Select any color you like. 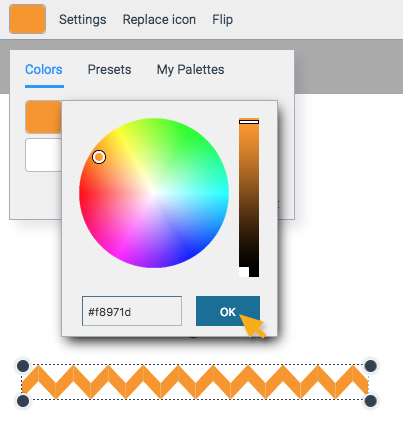 If you want to add colors, click on the +Plus sign and select any colors on the color wheel or add a hex#. 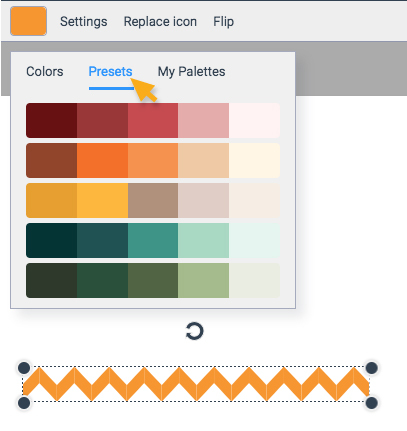 You can go to the Presets tab to get colors or create your own by going to My Palettes tab. Once you have the color that you want, click anywhere on the canvas and you are all set.